On miserable, rainy days like it is in Glasgow today, it’s nice to look back at things that bring back memories of Summer, the warmth of the sun on your skin, the sound of the waves lapping on the shoreline, the first swim of the day at 7am in complete solitude before the day trippers arrive and best of all, the 4 hour lunches when you can sit down, relax and enjoy your food without having to rush anywhere. We live in a country where everything is rushed, we don’t take time to enjoy the time with our families, to sit down around the table with some delicious food and good wine and have a good chat. In Italy, it’s different. There, long lunches are obligatory, you just have to join in, it’s the rule! There is nothing better than when we all get together as a family in Capri. We leave behind the hectic lives of school runs, sitting in rush hour traffic to get to work and are transformed into laid back, relaxed people whose only worry is what to eat that day. An important part of our day is sitting down on the beach having a family conference about the days menu. Since the shops close at 1-4pm we have to be organised and get there before they close. There, we shop daily, non of this going to Tescos for the weekly shop, no, fresh food every day. Costanzo will go and choose the best vegetables or fish or whatever we have decided to eat that day and head off to start cooking. We usually follow a bit later laden down with lilos, beach towels, footballs and of course the children and help prepare the meal. We set a great big table out on the terrazza, shaded from the heat of the sun and sit down to enjoy the best meal we have ever tasted (until our next one!) and just savour the whole atmosphere. Wine, of course, is plentiful and in the Summer Costanzo chops up fresh peaches and adds them to a giant jug of wine which goes down well with all of us! Wine doesn’t last long on our table but we think that it is because the peaches have soaked up all of the wine, honest. The worst part is doing the dishes, especially when Costanzo has decided to use his giant padella (frying pan) which is the size of a satellite dish. We groan when he gets it down because it is so big it doesn’t fit in the sink! So with those memories, our delicious dish today is one that Costanzo made last Summer in Capri. 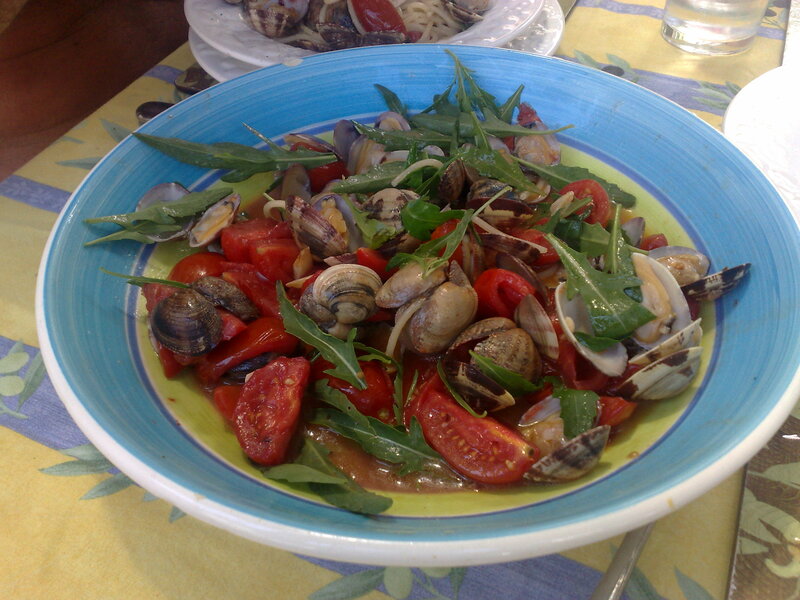 Spaghetti tossed with fresh vongole, fresh tomatoes (another donation from the neighbours) and rocket. The taste was just spectacular, coupled with the whole Capri atmosphere, it made for a perfect 4 hour lunch. Roll on Summer! Looks like a nice clean well laid out blog!